Cozy Chicks blog friends have a lot in common, especially when it comes to books and reading. We all love bookstores. We like to get lost down the aisles, immerse ourselves in the smell of books, read jacket covers, flip through the pages, read first paragraphs. Kindles and Nooks and all the other eReaders are great inventions and wonderful fun, but we still are on the lookout for a new bookstore to wander through. And we also are big on movies set around bookstores. Like the one here from You've Got Mail, where Meg Ryan takes on the mega-store along with Tom Hanks. Or this one - Flourish and Blotts in Harry Potter - where Harry, Ron, and Hermione buy their school supplies, including required reading like The Standard Book of Spells. Then there is the amazing train station bookstore and Mr. Labisse, the gatekeeper, in Hugo. Our very own Chick, Lorraine, writing as Lorna Barrett, has a booktown series, where Tricia Miles owns Haven’t Got A Clue. I don't have a photograph of Tricia's store, since it hasn't been made into a movie (yet), but an image is in my head, and it's fabulous. 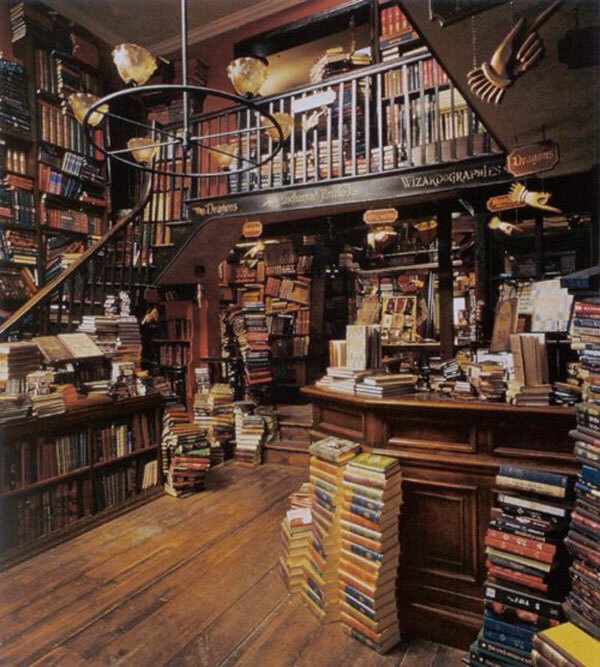 Which movie bookstores are your favorites? I'd have to go with Shop Around the Corner in "You've Got Mail". I love the old, cozy (Sorry had to say it) look. 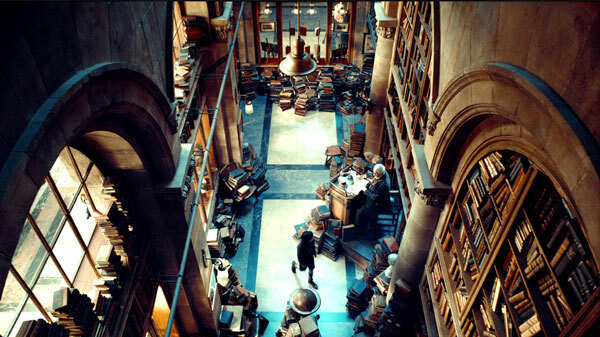 I love books in movies whether it is a specific bookstore, multiple bookstores, or libraries. The libraries in Beauty and the Beast, Inkheart and many many others! I think the libraries are my favorite because I want one in my house! I remember the scene in Beauty and the Beast, being taken into the library with its floor to ceiling books and my reaction; my heart fluttered! The Greenwich Village book store where Audrey Hepburn worked as a sales girl in the movie Funny Face was a really cool shop. 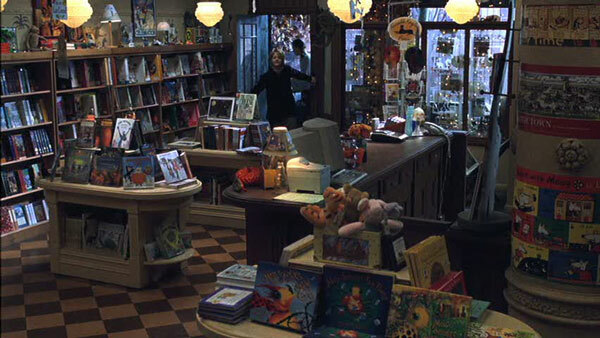 I have to agree with First of May's answer, Meg Ryan's character has the sweetest independent bookstore in "You've Got Mail". 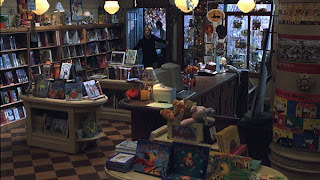 I love the ones you chose....the You've got Mail movie bookstore and the one in Harry Potter. I have not seen Hugo yet, but I plan to. I'm happy there is a bookstore in it.